Assembled environmental comfort meter device close-up (Lidia Pocero 2017). Scientists have always made their own equipment. Everyone who has done this the ‘traditional way’ – from scratch or trying to decipher a photocopy of a hand-drawn diagram in a monograph – knows that it is a non-trivial exercise. Although this ancient art is still practiced, the majority of experimental scientists now purchase their equipment. Low volume scientific hardware is not able to benefit to the same degree from economies of scale as more common consumer items have. But with the rise of digital manufacturing it is now possible to fabricate custom scientific components and tools for 1-10% of the cost of commercial scientific instruments using DIY 3-D printers (like the RepRap than can make its own parts), laser cutters, and PCB mills. There is a desperate need to have high-quality source of the state-of-the-art scientific tools, which have been validated and tested to produce precise and accurate results. In addition, these validated tools must come with all the design files (e.g. bill of materials (BOM), instructions, firmware, CAD, and software) to build, operate and maintain them effectively. HardwareX is fulfilling this need. In addition, rather than bury hardware tools that may be relevant to many disciplines deep in the specialty literature, HardwareX provides a central free repository of proven designs. Finally, it provides scientists a place to receive academic credit for the hard work involved in the development of high-quality scientific instruments. “I believe we are on the verge of a new era when you read of the latest advance in your sub-discipline and then follow a link to HardwareX to download the equipment plans.” Editor-in-Chief, Joshua Pearce. 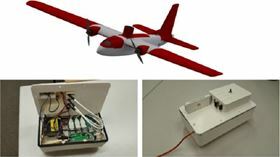 Long range UAV (top) with adapted ImPROV package (bottom, assembled with 3D-printed pieces) (Jean-Luc Liardon 2017). I believe we are on the verge of a new era when you read of the latest advance in your sub-discipline and then follow a link to HardwareX to download the equipment plans. The first eight papers we have published all show innovative hardware designs in a variety of research fields that you can easily replicate in your own lab. You can use them to recreate or perhaps improve upon the low-cost scientific open hardware alternative and then you may push the next breakthrough. By sharing, we all win and science moves faster than it ever has before. Now go and read the first issue of HardwareX and share with your colleagues. Or if you have a hardware design that you want to share with the world why not consider HardwareX as your next outlet? 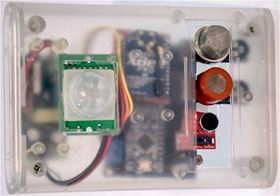 Lidia Pocero, Dimitrios Amaxilatis, Georgios Mylonas, Ioannis Chatzigiannakis, Open source IoT meter devices for smart and energy-efficient school buildings, HardwareX, Volume 1, April 2017, Pages 54-67. http://doi.org/10.1016/j.ohx.2017.02.002. Jean-Luc Liardon, D.A. Barry, Adaptable Imaging Package for Remote Vehicles, HardwareX, Available online 22 April 2017. http://doi.org/10.1016/j.ohx.2017.04.001. Find out more about the collaboration between HardwareX and Materials and Design journals. Materials Characterization and HardwareX are teaming up to showcase research that is undertaken using hardware designed by scientists.